Burlington Cross Training offers strength training workout routines to Burlington, NC and surrounding areas. What is Strength Training Workout Routines? Strength training is simply working your body through training exercises which causes your body to get stronger. Burlington Cross Training of Burlington, NC uses a variety of strength training workout routines which help your body increase in strength with each workout. Our cross training methods have been time tested to get you in the best shape of your life. We implement the same strength conditioning methods used by top athletes and mixed martial artists around the world. How are the Stength Training Workouts Conducted? Burlington Cross Training of Burlington, NC conducts our strength training workouts with one thought in mind – adding strength to your body each and every workout. The key is progressive resistance and proper rest. When starting a new strength workout, it is recommended to begin 3 days per week for the first 2 months and then progress to 4 or 5 days if you body is ready. For each strength workout we conduct at our Burlington, NC location, we will push your body a little more each time. Gaining true strength is not about lifting a single weight one time, but about training your body to have the strength and endurance to train or fight for extended periods of time. 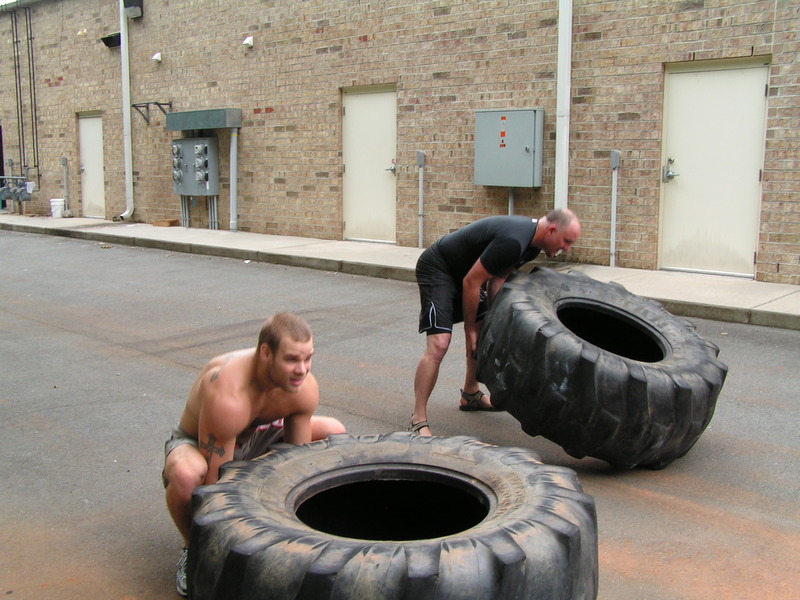 We help you build real-world functional strength and endurance. We will use a variety of strength and endurance methods to help you gain strength such as: tire flips, kettlebells, pull ups, sprints, olympic weights, box jumps, ball slams, hitting and kicking pads, working martial arts techniques, the sledge hammer, and much more. Who Can Participate in Your Strength Training Programs? The best thing about our strength training workouts is that anyone can participate. It does not matter if you have never participated in a strength training programs before, our knowledgeable instructors conduct a strength assessment and then design a program to fit your needs. We see strength results from both males and females, younger and older people. Contact us today at our Burlington, NC location for a free strength assesment and workout. We provide strength training workouts to Burlington, Elon, Gibsonville, Glen Raven, Graham, Glencoe, Mebane, Swepsonville, Haw River, Bellmont and surrounding areas of NC. Contact us today for more information on our strength and conditioning programs.